Look and feel fabulous in our range of trendy Sandals that will complement your spring/summer outfits. Designed with both style and comfort in mind, they are a real treat for your feet! 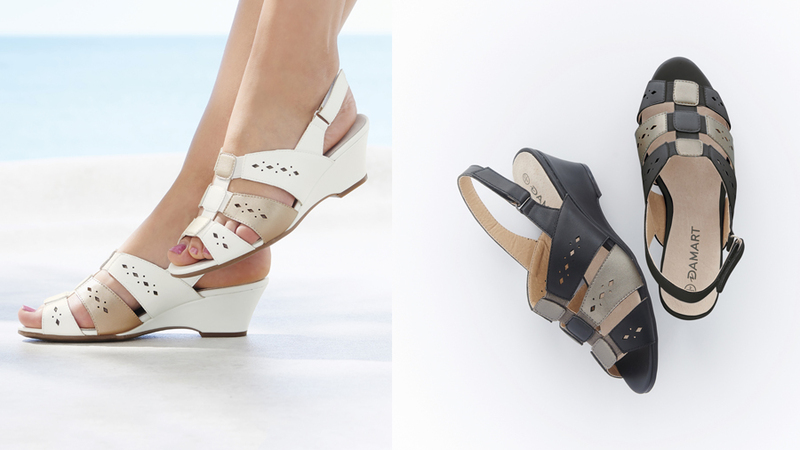 Put your best foot forward in our open toe Cushion Walk Sandals. They boast an easy elasticated sling-back style and wedge heel with leather insole for ultimate comfort. You can get these stylish sandals in a choice of 2 colours, light gold and light pink assorted, both of which will flatter tanned toes! Step out in summer brights with these Cushion Walk Flower Mules that come in a range of bright shades including coral, silver and white. They are the perfect combination of style and practicality with pretty cut-out detail, feminine flower feature and comfortable cushioned sole. With an easy slip-on style and a wearable wedge heel that your feet will love, they are just perfect for the season. 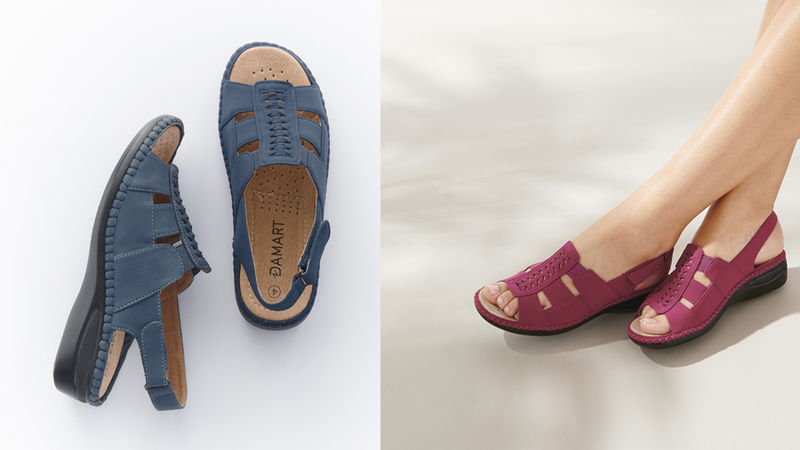 Treat your feet this season to these stylish Sandals with a small wedge heel. Also, with adjustable straps and leather lining, they are super comfortable to wear too. Available in a gorgeous platinum and grey, both will pair nicely with many outfits and are a perfect addition to your summer wardrobe. A stylish addition to your holiday suitcase, these Sandals boast arch support and straps with stretch to give you ultimate comfort. They also have a cut out detail adding a glam touch to your look this season. With a chic choice of white assorted and black assorted, you can pick the perfect pair to match your favourite outfit. They’re bound to become your summer favourites! Add a splash of brightness to your spring/summer outfits. With a durable sole and low wedge heel, these Sandals will take you from sight seeing to shopping trip to dinner out! Available in blue and raspberry, they will complement so many outfits and are the ideal pair to take on holiday. They also come in a choice of 2 widths, E and EEE so you can find your perfect fit for your feet! For a glamorous look this season, wear these wedge Sandals. With gorgeous diamanté detail that adds a touch of sparkle, this pair is ideal for summer evenings and holidays. 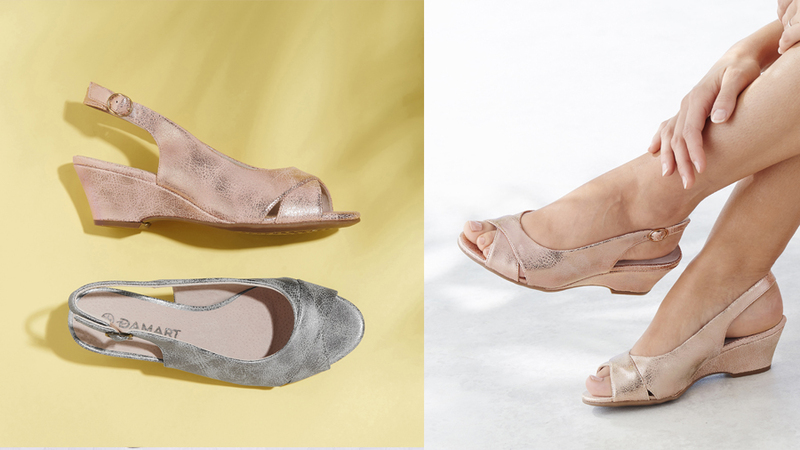 In addition the adjustable touch-fasten straps and buckle slingback straps ensure you get the fit that’s just right for your feet. They’re cushioned for your comfort so you can wear them all summer long!